27.8.8 Annabella North-Bomford (Only daughter of David) 1868 - ? 27.10 Belinda Emily North-Bomford c1849 – ? Isaac North c1791 - 1866 (23.7), and Belinda Emily (Pilkington), c1804 - 1852, had been living at Ferrans since their marriage on 8th October 1830 (23.2), but Issac had been there longer, since perhaps 1820. During these early days Ferrans belonged to Isaac’s uncle, Isaac Bomford (23.1), and although he rented and farmed the place, he did not come into it until his uncle died in 1837 (24.9.4). Part of the terms of the inheritance (23.4.1) was that he took the name of Bomford, which he did in 1837 and so became Isaac North-Bomford and assumed the title to Gallow (596 acres) and Ferrans (412 acres). North family tree. About 1837, certainly before 1842, he was commissioned a Justice of the Peace for County Meath, remaining a JP until his death. He was later made an ex-officio Guardian of the Trim Union (Workhouse) covering the period around the 1860s. The Dublin Almanacks and Street Directories indicate that the North-Bomfords had a town house, but there is no record that Isaac owned the houses. 1. No 17 Lower Dominick Street. This Isaac is Isaac North-Bomford’s uncle who died in 1837 (23.4) and the house must originally have belonged to him although he lived in Blessington Street. It is not known when he first bought the house but he must have left it to his nephew together with Ferrans and his land. There is no J. B. Bomford or North-Bomford so the name must be an error: it would not be Isaac’s second son John who was only 12 at this date. However the entry is important since it shows that the house was in the name of Isaac’s wife, Belinda Emily. Dominick Street lies on rising ground in the then fashionable North Dublin between the Rotunda and King’s Inn. The street was built in two phases, Lower Dominick Street in 1775 and Upper Dominick Street in the 1850s, so Isaac’s house was on the very edge of town. In 1785 it was the most aristocratic of the North Dublin Streets and contained the residences of two peers, six members of the Irish Commons, a judge of the King’s Bench and half-a-dozen other barristers, three sheriff peers, the Seneschal of the King’s Manors, the City Chaplin with the other houses occupied by professional men, lawyers, doctors, etc. By 1800 the legal element was increasing: lawyers occupied 26 houses in 1834, and 31 in 1850: but by 1875 the legal elements had sunk to 17 and ‘trade’ had lowered the tone, there were even two lodging houses. This reflected in the rateable value of Isaac’s house: £80 in 1850, £52 in 1852 and £48 in 1860. 2. ‘1861 - 1863 Isaac Bomford Esq., 8 Upper Temple Street. Rateable value £46’. 47 years previously, in 1814, Arbella Bomford bought No 21 Temple Street (18.9.2) for £900 and rent of £100 a year. This used to be another fashionable street but one can see how it deteriorated in those 47 years by the value, from £100 to £46. This was typical of the age when prosperous people were moving to the suburbs. Isaac North-Bomford had this house for three years after Dominick Street, and on its sale the family ceased to have a town house; although their children lived in Dublin they did not have a house for any length of time. Sandymount was developed in the mid 1800s to accommodate the general exodus from city to the suburbs. No 6 Sidney Terrace would have been a small house, newly built in 1847, a sort of holiday home beside the sea. Isaac had the house for just the one year 1847 - 1848 and this move was probably due to the pestilence of the famine which was at its worst that year; the thought no doubt being that the sea air would keep disease away from Isaac’s young family of nine children, the eldest being about 15. Belinda Emily Pilkington died on 30 June 1854, aged 55, and was buried in the Mount Jerome Cemetery, Dublin. Her parents Abraham John Pilkington and Maria (McHugo) of Kilbride Castle in Westmeath were married in 1803 and had two children, Belinda and Homan, so the earliest that Belinda should have been born was 1804, and when she died she should not have been older than 48 but possibly younger: the tombstone inscription says otherwise. Isaac North-Bomford, himself then aged about 54, was left with a young family of seven ranging in age from 18 down to about 3, with one daughter married and another probably dead. Isaac and Belinda had nine children, five sons, and four daughters, but a boy and a girl ‘died young’. The sequence of their births can not be given with accuracy as the boys are listed first in order followed by the girls, and the girls birth dates have not been found. However, bearing in mind marriage dates, the age of Belinda Emily and extended gaps in known birthdays, three of the girls have been placed amongst the boys, the eldest child being a girl. 6. Stephen Robert, ‘died young’ in 1856. He is placed in Burke between David and Horatio so would have been born during the years 1841 to 1846, though most likely c1843. Therefore he died aged about 13. His mother's tombstone at Mount Jerome records that he died on 27 Oct 1856 aged 14. 7. Louisa Emily, also ‘died young’. She could have been born c1845. It is a pity that there is such a scarcity of information about these children. If we knew where they were born or were baptised then we would be able to make a better guess as to whether Isaac and Belinda lived more permanently at Ferrans or in Dublin. 5 & 6. ‘Rateable Annual valuation’ of the ‘Land’ (5) and ‘Buildings’ (6). The valuation was calculated at 25% below the letting value of the land, and the letting value was 1/3rd above the government valuation. Although the land increased in value there was little change in the letting value until about 1890 because the tenants' rent was not frequently altered, a 30-year lease being the norm at the time. However when it was altered it generally rose to about 1½ times the amount of the government valuation. The valuations of the buildings give an indication of the lessor's wealth or poverty. The best houses were valued at £10 or more; those around £5 probably had slate roofs, a few rooms and were built of stone; those at £1 were cabins with a thatched roof, and perhaps two rooms with walls of mud; those at 5/- would be one room, probably without windows and quite likely without a chimney, the smoke going out through the door or out of holes through the thatch at either end of the roof ridge. This total of 401 acres is 11 acres short of the 1836 total, which is probably because the south boundary of Ferrans is the River Ryewater, a stream that rises in a spring in Bacontown. In 1797 Ferrans Lock and the bridge over Royal Canal were built, and the Ryewater was given a new course north of the canal. In 1836 the survey map shows two small plots of Ferrans south of the canal which do not seem to be so in the 1883 map; it would be sensible if these two plots were sold and, if so, would just about account for the 11 acres difference. In 1836 Mr T. Potterton had about 250 acres, now the Rev. John Potterton (his son?) has 377 acres; whereas in 1836 Isaac Bomford had 596 acres, now his nephew only has 467. The total Gallow acreage is much the same but now Potterton has increased his holding by 127 acres and Isaac has deceased his by a similar amount. Isaac himself farms 407 acres (Ferrans 393 and Gallow 14), probably assisted by the four men living on Ferrans. In addition he leases 453 acres to Patrick Maher which would bring in a gross income of around £625 (£500 plus 25%); this income is less that that of pre-famine 1836 when the land was leased at £2.10.0 an acre, now it is only about £1.5.0 an acre. Patrick Maher was a big farmer for he not only leased these 828 acres but also 491 acres of Drumlargan from George Bomford. An earlier description of Gallow and Ferrans, then belonging to Isaac Bomford, is at 23.3.2. Gallow House has not been occupied by a Bomford since about 1809, and, although it remains a Bomford house, a Bomford does not again occupy it. It looks as though at this date Patrick Maher is living there. It is doubtful if it was ever actually owned by a Bomford even though some Bomfords had lived there on occasions. It was previously suggested that it was on part of Gallow townland originally owned by the Winters and that it was their property: nothing has come to light to support ownership by either the Winters or the Bomfords, but Forth in his investigation suggests that it was a Winter property. It was burnt down accidentally in the early 1830s and rebuilt; now it appears that the Rev. John Potterton is living there. Ferrans House was the North-Bomford residence and remained so until the family sold the place in 1967. However the house must have been enlarged at some date, sine the 1854 rateable value of £14 is far too small for the house, which was there in the early 1900s. An extension to the house may have taken place prior to 1867, because in that year a lodge was built (see below), and a lodge would hardly have been built for an unimpressive house valued at only £14; indeed the whole house may have been rebuilt. In this respect it is noteworthy that the Dublin house was given up in 1863 and, perhaps, a new house was built just prior to that date so that the family could occupy it permanently from 1863. The argument against a completely new house being built is the statement in Burke’s Guide to Country Houses, which states that Ferrans is ‘a 2 storey 5 bay late-Georgian house’, so probably the original house was just enlarged and done-up. the lease of Brayfield, part of Ferrans, by John North-Bomford of Ferrans House, late Captain of Her Majesty’s 29th Regiment of Infantry, to Horatio Bomford (his brother) of Landsdowne Road, Dublin. This deed reads as though it was Horatio (27.9) who built the house and he may have done, but he was only 20 at the time and a younger son so it is unlikely that he paid for it. It is more likely that John paid for it; he was then the head of the family since his elder brother Isaac had died in 1862 and his father in 1866. An interesting census was carried out in 1871, townland by townland throughout Ireland. The number of houses and the population are here compared to previous 10-year numbers. 1841 is pre-famine, and the steady exodus of Irish to America and elsewhere is reflected in the later figures; over the 30 years the total drop was from 116 people to only 27; a decrease of three-quarters of the population which was not considered to be unusual. If each house held one family then we may assume that 11 families left the two townlands because of the famine, but, in addition, the numbers in each family also dropped, so many of the older children of those families which remained must have also left; this movement away from the land to the towns was to become the trend in Meath where the farmer concentrated on raising cattle rather than the more labour intensive tillage. Very little is known about Mary Jane but there are two deeds concerning her marriage to John Emerson. It is largely because of the date of her marriage settlement that Mary Jane has been placed as the eldest child, and even so she would only be about 18 in 1850 at the time of her wedding. On the marriage intended between John Emerson and Mary Jane North-Bomford, John Emerson hands over on his death in trust to John Roger North the lands of Castletown in the Barony of Ballygowan (in King’s County) so that Mary Jane North-Bomford will have an annuity of £150 after his death. (1850 Book 4 No 196). Reciting the marriage settlement (27.4.1) between Mary Jane Emerson, then Mary Jane North-Bomford, and John Emerson in which she was entitled to a jointure of £150 per annum on land therein mentioned. Some of these lands were purchased for Railway purposes and the money invested in £302.17.1 Government 3% stock in the hands of the trustees (party 2). Now Mary Jane Emerson has borrowed £277 from the above and the balance is charged upon the lands of Castletown in King’s County. (1871 Vol 14 No 254). The marriage licence was issued by the Diocese of Dublin and dated May 1850 (page 488), so the marriage probably took place that month in Dublin from Isaac’s house in Dominick Street. John Emerson of Monkstown Esq married Mary Jane Bomford of Lower Dominick St on 7 March 1850 (St Mary COI parish records, Dublin). The March date fits with the date of their marriage settlement. The groom, John Emerson, must have been a guest of John Roger North who was married to John Emerson’s only living sister, Elizabeth. The father of John Roger North was David North, brother of Isaac North-Bomford; so the Emersons, Norths and North-Bomfords were closely connected; but there is a further connection on the bride’s side of the family. Mary Jane’s mother was Belinda Pilkington and she was a first cousin to John Emerson’s father, Horatio Emerson. Paragraph 23.2.1 includes a family tree showing these ramifications. Glasthule, where John Emerson was living at the time of the marriage, belonged to the North family and, according to the Dublin Directory was more probably named ‘Fortwilliam, Glasthule, Kingstown’. It was last occupied by Lady North in the mid 1880s; it is not clear who ‘Lady North’ was, but it does indicate a relationship between our North family and that of Lord North and the Earl of Guilford. The English Emersons (27.4.4) gives John's name as John Joseph Emerson. Burke places John Emerson of Clonshanny and Deer Park, both in King’s County; neither of these places have been located. The marriage settlement concerns Castletown that is close to Kilnagarna and Bellair, both Mulock properties in King’s County. Deeds of 1862 and 1863 record John Emerson ‘of Gallow’ so at some stage the Emersons must have leased and perhaps have lived there; prior to this, in 1857, another deed gives his address as No 8 Bachelor’s Walk, Dublin. Yet another deed of 1867 places him at Banagher, King’s County, where he probably died. Richard Emerson (email 30 May 2015) has found a reference to the Freeman's Journal of Dublin of 3 Sep 1861 stating 'In the Matter of The Estate of John Emerson, Owner and Petitioner. rpo I tb BE SOLD, ... LOT 2 Another part of the Lands of Castletown, known as Clonshanny'. Which places Clonshanny as part of Castletown. As to the estate of John Emerson referred to, what the newspaper says has not been checked: John was still alive in 1861 so it is not a deceased estate; it may be a reference to matters in the Court of Encumbered Estates. His daughter, Frances Wetherall Emerson, described her parents: "Music - from the Bomfords - my mother was called the 2nd Alboni in her young days - my father had a tenor voice and sang I've been told beautifully - all the North-Bomfords were very musical. My mother had very dark hair with a creamy skin & my father was a golden man - hence our red hair. The North-Bomfords were famous for the beauty of their hands and arms and feet. I don't remember my father, I was a baby in arms when he died - all the girls take after the Emersons, the boys, my brothers, resemble more the Bomfords. Dear David was like poor mother but Isaac was like my father in face" (Letter from Frances Emerson , 37 St Mary's Terrace, W2 , to Mary Nellie [Molly] Emerson, 18 Jan 1936: Richard Emerson email 3 Jun 2008). The years in which these two died are not known, but we can speculate. John Emerson must have died between 1867 and 1871 according to the deeds, but in view of the context of the 1871 deed, probably in 1870 at Banagher. His wife Mary Jane seems to have remained for a while at Banagher on the Shannon where the Reverend Bell, one of the later trustees, was the rector. (In 1872 he became Rector of Kells where he remained until 1887.) In 1878 Mary Jane appears as ‘Mrs Emerson’ in The Dublin Directory and was living at Greenfield, Sutton near Howth, where she stayed until 1882. This had been an Emerson house for some years and Mary Jane’s two sons, Horatio and Henry Robert, had been living there from 1873. In 1883 the Directory stopped recording ‘Mrs Emerson’ as the occupant of Greenfield and substitutes her son Henry Robert. http://www.limerickcity.ie/Library/LocalStudies/ObituariesdeathnoticesetcfromTheLimerickChronicle/Alphabeticallistingsofobituariesdeathnoticesetc/e.pdf lists Emerson, Mary Jane of Cooper Hill, Clarina, Co. Limerick, 7 Nov 1895, widow of John Emmerson of Clonshanny and Deer Park, Ballycumbert, King's Co.; d. at res of her son-in-law. If this is so, both died rather young, John aged 44 and Mary Jane about 50. "John 1810 [sic] m Mary Jane Ann Bomford [in 1850] of Fearns Co Meath; lived for a time at Gallow, Co Meath [another place of the Bomfords], moved to Banagher in 1865. Wanted to build a house at Ballycumber but was killed by an explosion while blasting stone in a quarry, 1868, for the house he was building" (letter from Horace Emerson, undated but after 1949, from Clonshaney, Sway, Hampshire: Richard Emerson email 3 Jun 2008). The Index to Prerogative grants in the Public Records Office records 1868 John Emerson, Letters of Administration of personal estate of John Emerson, late of Banagher, died 1 July 1868 granted to Mary Jane, widow (Richard Emerson email 4 Jun 2008). It was thought there were eight children but only three had been definitely located, with two probables. Further information came to light in 2007 in the form of an extract from pages 151 and 152 of The English Emersons: A genealogical historical sketch of the family from earliest times to the end of the seventeenth century, including various modern pedigrees, with an appendix of authorities , by Peter Henry Emerson, published in London by D Nutt, 1898, deluxe edition, limited to 50 copies ('the book') (email 24 Apr 2007). It gives a list of 10 children, and appears to have been contributed by Frances Wetheral Mulock or Frances Anne Emerson (the first is referred to as 'myself', the second is the name of the person who signed the contribution, which is dated Clarina, July 17, 1896). The order of the children below is the order in the book. 1. Horatio Emerson, the eldest son, was born 9th May 1851 and so was also the oldest child. He was living at Greenfield in Sutton in 1873 but nothing else is known about him, though, since his younger brother sold Greenfield in 1885, he may have died before that date, in his early 30s. The book says Horatio died young. Richard Emerson's tree (email 31 May 2008) says he lived from 1853 to 1877. Frances Emerson (Richard Emerson email 3 Jun 2008) says he died in Leitton [sp?] outside Dublin from inflamation of the lungs, aged 26, never married. elder daughter of Lt Col Isaac Bomford Emerson, Queens Parade Bath. (b) Evelyn Rosemary Minnie Wetherall Emerson, married Gerald Maunsell Gamul Farmer, known as Scrum, d 1972 aged 76, changed his name to Wilshere in 1934 to inherit The Frythe estate, Welwyn, Hertfordshire, and they had two children. 3. John Joseph North Emerson, MD, known as Jack, born 1858, of No 1 Belgrave Square, Rathmines in South Dublin, witnessed the marriage settlement of Belinda Emily North-Bomford and Edward Napoleon L’Estrange in 1878. He is almost certainly another child, and he witnessed the deed with his brother Henry Robert Emerson. Richard Emerson's tree (email 31 May 2008) says he lived from 1858 to 1918. Frances Emerson (#10 below; Richard Emerson email 3 Jun 2008) says he 'made an unfortunate marriage'. "John Emerson was a doctor and was married. He practised in Kings Co, I think and died there. The marriage was not approved of nor was it a success. I remember going down with Pater to shoot rabbits with him as a boy - NO sign of a wife or family but as far as my memory goes there were children - girls I think" (letter to Molly Emerson from Horace Emerson, undated , sent from Clonshaney, Sway, Hampshire: Richard Emerson email 3 Jun 2008) . and from 1899, 71 Dame Street. and from 1899, No 88 Ranelagh Road. Daddy practised for years and years and finally died of a stroke - my parents were never thrifty and as I say lived far above their means. But when it came to fund Horace and Vivian through Trinity & Vera and myself at the Abercorn College, they knew only too well what it meant to pinch and screw - there was no State aid in those days or feather bedding as you people know it today ... every penny had to be found by parents. Horace once said we knew we were being given one chance and it was up to us to sink or swim - They worked their guts out, they both played Rugby and Rowing. Vivian was already in a 4 and Horace 8 - he turned out a wonderful oarsman. The Leander coach - I can see him now in his pink cap and cream blazer with pink facing, coaching Horace's 8 along the towpath - he wrote in the paper he considered Emerson the finest oarsman in England or Ireland, indeed asked Horace to row for Leander. H said he was a Trinity Man. The winning Trinity 8 at Henley was asked to compete at the regattas in Ireland and I remember Horace was in a fix because he did not have the necessary money to go with his boat and did not feel he should ask his father so I persuaded him to pawn a diamond and pearl brooch I had. I believe the pawnbroker put some scratch or sign on the article. I am a proud as punch of that sign today ... I may show you the brooch one day (Richard Emerson email 3 Jun 2008). Mrs and Mrs Henry R Emerson gave a party in 1889.
d) Vera Minchin Emerson, born 1888 and died 1911. Dublin City Library ('community memory' database) records the insciption on a plaque: 'To the glory of God and in ever loving memory of Vera Emerson who died 4th May 1911 aged 22'. 5. Charles St Leger Shervington Emerson, born c1855 and died at Cham, Victoria, Australia, 1934 aged 79. There is a “Charles H G Emerson Esq. of 21 Harbour Road Dalkey” in the Dublin Directory of the 1880s. According to the book, which provided his second and third given names, and according to Frances Emerson (Richard Emerson email 3 Jun 2008), he died unmarried. "No one ever heard of, or from, Charlie who went to Australia" (letter to Molly Emerson from Horace Emerson, undated, sent from Clonshaney, Sway, Hampshire: Richard Emerson email 3 Jun 2008). 6. David North-Bomford Emerson, born 6 Aug 1864 at Summerhill, Co Meath, died 1908 at Bedford, England, married (Richard Emerson's tree (email 31 May 2008) says he died in 1894) Emily Constance Martyn, daughter, according to the book but apparently incorrectly because of an error in information supplied by the family of the late Samuel Martyn of Thurloe Square, London. Richard Emerson (Rick Smith email 26 May 2008) has a parchment, perhaps from the 1860s, which lists the children of Silas Edward Martyn and Mary Matilda Allin. Their seventh child was Emily Constance Martyn, born 18th Aug 1861, christened 21 Sept 1861, sponsors William H Liddell, Elizabeth Harbin, Annie Darke; Betty Eileen Bomford Emerson notes next to that entry that Emily died 18th April 1952 at Field House Put (illegible) Lane, Bedford; all the children were christened at All Saints, Knightsbridge. David and Emily had issue (details from Richard Emerson email 28 May 2008). a) Mary Nellie Bomford Emerson or Mary Eileen Emerson, known as Molly, aged 10 months in July 1896, died 1982 at Lymington, Hampshire, married Captain Douglas Chaworth-Musters MC (see http://www.sandars.org.uk/Geneology/) and had four children. i) Hugh Bomford Emerson b 22 July 1923, Ramsay Hospital, Naini Tal, India, died Southampton, Jan 1990. He was a Major in the 3rd (King's Own) Hussars. He is buried at All Saints Church, Milford on Sea, Hampshire. He married and had two children. iii) John Allin Emerson, b 11 Feb 1926, died Nov 2007 at Sutton Courtenay, Oxfordshire and is buried in the Church Yard at All Saints Church. John Allin Emerson married Eileen Dunderdale, who died 2002 at Sutton Courtney, Oxfordshire. She is buried in the church yard of All Saints Church, Sutton Courtney. It was her second marriage. She had three children, all living in 2008, from her first marriage but had no children with John. 7. Frank Emerson, died as a baby (Frances Emerson: Richard Emerson email 3 Jun 2008). 8. Belinda Bomford Emerson, born in Dublin 25 December 1858, baptised 10 April 1859 from 6 Wellington Terrace, Leinster Road (Rathmines parish records, Dublin), died 1938, married at Portarlington, Queen’s County, 15th June 1887 to James Cooper-Cooper who was formerly James Cooper Tuthill, as his second wife. He was born 16th March 1825, took the name Cooper and inherited Cooper Hill, Co Limerick, from Mrs Honora Cooper. He had 15 children by his first wife, most of whom were older than Belinda. Belinda at the time of her marriage was aged 25, whereas her husband was 62. Not surprisingly they had no children. "I also remember Aunt Belinda, or Linda, as she was called. She was very sweet, and very dainty. She married a widower with lots of children and she usd to tell me how she had to think of ways of keeping them amused in the evenings. No TV in those days. She had no children of her own" (Peggy Nuttall to Hugh Emerson, undated: Richard Emerson email 3 Jun 2008). 9. Elizabeth Emerson, died as a baby (Frances Emerson: Richard Emerson email 3 Jun 2008). (10.) Frances de Wetherall Emerson. Frances is not listed as a child in the book, but is shown in Richard Emerson's tree (email 31 May 2008). Frances de Wetherall Emerson was born on 22 April 1866 at Banagher, Kings Co (Richard Emerson email 28 May 2008 ); Frances de Wetherall Emerson of 19 Cunningham Road, Paddington SW12, died on 30th March 1949 (Richard Emerson email 2 June 2008). Frances Wetheral Mulock is referred to in the book in the form 'Question 1.- Frances Wetheral Mulock (myself)', and it is presumed this is the same person. The 'contributor's father' is John Joseph Emerson. "I also remember Aunt Fanny. She had a fine voice, and when she was a child, I was told, someone from London heard her sing and offered to take her to London to live with his wife and family and have her voice trained - this our great grandparents refused. Then when she was seventeen I believe a farmer asked her parents if he could marry her. But Aunt Fanny did not want to marry him and ran away from home and joined a travelling Theatrical Company. But because her voice had not been trained she never got on too well - and then she became involved with this actor friend, and they lived in a flat in Paddington, until she died" (Peggy Nuttall to Hugh Emerson, undated: Richard Emerson email 3 Jun 2008) . The Arts and Humanities Research Council Pamplets - Ireland - Concert programmes, 1844-1922, includes: 28 May 1886, Royal University, Dublin Musical Society presented Mary Russell, Fanny Emerson, WB Martin, John Horan, RM Levey, Mr Horan conducted by Joseph Robinson, 10th Season, 2nd Concert; and 4 Dec 1890 14th Season, 3rd Concert, Principal Artistes: Miss Edith Montgomery, Miss Fanny Emerson, Mr Henry Piercy and Mr Plunket Green, Full Band and Chorus, 350 performers (Richard Emerson email 8 Jun 2008). She also sang in the D'Oyly Carte Opera Company between 1894 and 1923. She married Harry Reginald Hignett, b 29 Jan 1870, d 17 Dec 1959; he was an actor and also a filmographer (Linda Holewa email 11 Nov 2009). "The Dudgeons all went to Canada and we have lost all trace of them. I think one or more of the sons were killed in the 1st World War" (letter to Molly Emerson from Horace Emerson, undated , sent from Clonshaney, Sway, Hampshire: Richard Emerson email 3 Jun 2008) . That is the end of the list of children given in the book. It left out the 'contributor', 'myself' and two other names. Frances Wetheral Mulock is referred to in the book in the form 'Question 1.- Frances Wetheral Mulock (myself)'. The question has not been seen yet, but it may shed some light on the answer. There is also a reference to 'John Joseph Emerson (contributor's father)'. There are two John Joseph Emersons: the one who married Mary Jane North Bomford, and their third son, Doctor John Joseph North Emerson, MD, born 1858. A daughter of the latter would have been too young to have made the contribution to the book by 1896. 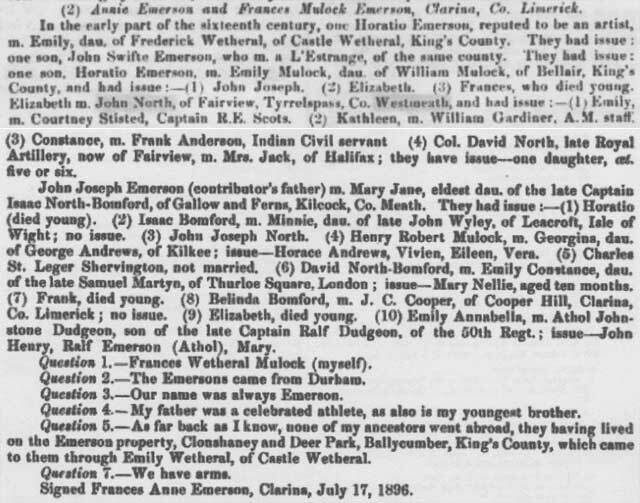 Rick Smith lists Frances de Wetherall Emerson as a further daughter of John Emerson and Mary Jane North Bomford. Richard Emerson (email 28 May 2008) says Frances de Wetherall Emerson was born on 22 April 1866 at Banagher, Kings Co and died in 1949, which is consistent with Rick Smith's placement. All of this points to her being a daughter of the senior John Joseph Emerson, and she has been put in the family above at number 10. The contribution in the book is attributed, 'Signed Frances Anne Emerson, Clarina, July 17, 1896'. There are also the names at the top of the extract, Annie Emerson and Frances Mulock Emerson, Clarina, Co Limerick. These latter three have not been placed. For more on the Wetheralls/Wetherelts, see page 304 in An Account of the Early Septs and Later Settlers of the King's Countiy and of Life in the English Pale by F R Montgomery, MA, Dublin, 1908. Another Emerson listed in the Directory in the 1880s was Rev J Meadows Emerson of 99 Bushfield Avenue, Donnybrook. Another Emerson found in the Trinity College Register of 1928 that lists graduates living that year was Rev George Emerson, qualified MA 1896 TCD, of St Peter’s Rectory, Bandon, Co Cork. He was likely from a branch of the Emersons that was in Cork from at least the 1700s and as far as is known is not closely related (Richard Emerson email 29 May 2008). Burke simply records that Isaac was born on 6th June 1834, was a Captain in the 59th Regiment and served in China, and died unmarried on 6th April 1861. A little more information can be gleaned from the Dunlin Almanacks and the deed below. There is also a probable error in his death date. When Isaac was born in 1834 his parents had been married nearly four years and so it is thought that he was actually the second child, the eldest being his sister, Mary Jane. There are three relevant entries in the Almanack concerning his army career. In 1854, when he was 20 or 21, he was gazetted a lieutenant in the 59th Regiment of Foot, later to become the 2nd Nottinghamshire Regiment. In 1859 he was gazetted a captain in the regiment, and in 1863 his name was omitted from the Almanack. More information comes from the next deed. 5. Elliott E. Whitney of Woodlands, Co Wexford; and Benjamin Whitney of Lower Gardiner Street, Dublin, (husband of sister Annabella). Both Ferrans and Gallow has become vested in Isaac Bomford. In about 1835 Isaac Bomford agreed that they pass to his nephew, Isaac North (party 1) and his heirs. Isaac North-Bomford for £1,000 out of £4,000 purchased a company in 1857 in the 59th Regiment for his son Isaac. This deed confirms that Isaac was a captain but adds that the rank was purchased, a common practice in those days, and that the money came from his inheritance of £4,000; there is a discrepancy over the date he became a captain, 1859 in the Almanack or 1857 in the deed. However the important item in this deed is that in March 1862 Isaac was alive and living at Ferrans, whereas Burke states that he died the previous year on 6th April 1861; it must therefore be assumed that the date of his death should be amended to 6th April 1862. He probably died at Ferrans aged 28. He must have died in 1862 since in March of the next year, 1863, there is another deed (28.2) which has the same people in parties 3, 4 and 5 and which concerns the entail and Isaac’s younger brother John who had by then become the heir. His mother's tombstone at Mount Jerome confirms that her best beloved son Isaac B Bomford, Capt 59th Regiment, died 6 April 1862 aged 28. Probate for Isaac's will is recorded in Irish Will Calendars, 1858-1878 in 1862 (as Isaac Bomford Bomford). The Index to Probate and Administration Calendars 1858 - 1877 (National Archives, Dublin) records that Isaac Bomford, late Captain 59th Regiment of Infantry died 6 April 1862 at 136 Leinster road, Rathmines, Co Dublin, and his will was proved in an amount under £100 on 19 August 1862 by Benjamin Whitney of Middle Gardiner St, City of Dublin, solicitor, one of the executors. The 59th Regiment embarked for China in 1849 and no doubt Isaac joined them in China after training in England before he was gazetted a Lieutenant in 1854. The regiment’s tour of overseas duty ended with a spell in the Cape of Good Hope, and on return home they were stationed at Athlone in 1860. The years 1856 to 1860 were the period of the Second Foreign War of China, sometimes called ‘the Second Opium War’, and Isaac almost certainly took part in this war, at any rate up to the treaty of 1858. After sporadic fighting the combined British and French army took Canton in 1857, then in 1858 went north to Tientsin and captured the Taku forts guarding Peking. To save the capital, Peking, the Chinese made a treaty in which one proviso was that foreign powers could take up residence in Peking. However in 1859, probably after the 59th and Isaac had left, the foreign powers attempted to go to Peking but found their way blocked and fighting broke out again. Peking fell in 1860, another treaty was made, and there was a period of comparative peace in China for the next 30 years. Burke only gives the year 1866 as the date Isaac died, but from Lyons' ‘Grand Juries of Westmeath’ and the deed of 1873 (Vol 4, No 161) [? ], we now know it was on 10th October 1866 that he died. He would have died at Ferrans and may have been buried in Gallow Churchyard with his grandparents, unfortunately there are no surviving Bomford tombstones there and the records are missing. The Gentlemen's Magazine (1866, printed by F Jefferies, at page 838, Google Books) records "Oct 10. At Ferrans, co. Meath, aged 71, Isaac North Bomford, esq., of Ferrans. The deceased, who was a magistrate for co. Meath, was married and is succeeded in ..."
His will has not been located, but his sole executor was his son-in-law, the solicitor Benjamin Whitney (27.6.2). It would appear that his children received a lump sum according to his will or, more likely, his marriage settlement, but it is not clear how much. Probate for his will is recorded in 1866 in Irish Will Calendars, 1858-1878. The Index to Probate and Administration Calendars 1858 - 1877 (National Archives, Dublin) records that Isaac North-Bomford of Ferrans Esq JP died 10 Oct 1866 in the same place, and his will was proved in an amount under £14,000 on 2 Nov 1866 by Benjamin Whitney of 29 Upper Fitzwilliam St, Dublin, solicitor, sole executor. Annabella was the second daughter of Isaac and Belinda North-Bomford, and she has been placed as the third child with a birth date of around 1836. She was about 16 when her mother died and the job of bringing up the younger children, the youngest being only about 3, would have fallen largely upon her shoulders. It is not clear whether she spelt her name in one or two words; both ‘Anna Bella’ and ‘Annabella’ have been seen but the latter appears more often. She married Benjamin Whitney on 12th April 1860 when she was about 23, and the Whitney half of her marriage settlement follows. No trace of the North-Bomford half has been found which is a pity as it might have clarified her parents' marriage settlement. The marriage probably took place from 17 Dominick Street where she and the rest of the family were living. No marriage licence has been found. 1. Benjamin Whitney of Middle Gardiner Street, Dublin, Solicitor. 2. Annabella North-Bomford of Lower Dominick Street, Dublin, spinster. 3. Isaac North-Bomford (father) of Lower Dominick Street. 4. David George North-Bomford (brother) of Lower Dominick Street, and Edward John Irwin of Carranure House, Co Roscommon. (The two trustees). Burke’s 1912 Edition records the Whitneys as a County Wexford family from the early 1700s. Benjamin’s father was Nicholas Whitney of Castleview, Old Ross, Co Wexford; Nicholas was baptised on 13th March 1805, was married on 21st March 1833, and died just a year after his marriage, in 1834, and during the lifetime of his father, Benjamin’s grandfather; he was buried at Old Ross on the 8th March 1834, aged 29, just under three months after his only child, Benjamin, was born. His wife, Benjamin’s mother, was Mary Gore Jones, the daughter of Thomas Jones. She was born in 1810 and died, aged 85, on 20th March 1895. Another relative, possibly a cousin of Benjamin, was Elliott Elmes Whitney of Woodlands, Co Wexford, who was coupled with Benjamin in three North-Bomford deeds. Nothing is certain about him. Benjamin was born on 23rd December 1833 and must have been brought up by his mother although nothing is known about his early life; he became a solicitor in 1855 and as such was party to at least six North-Bomford deeds. He lived initially at 63 Lower Gardiner Street, about 1866 he moved to No 29 Upper Fitzwilliam Street and this house still belonged to him in 1912. In addition, from 1882 he owned No 5 Royal Marine Terrace in Bray, valued in 1884 at £65, and it is thought that perhaps this house became later known as Brayfort House. He remained at Brayfort House until his death and Burke records him as ‘of Brayfort, Bray, Co Wicklow’. In 1878 he became Clerk of the Crown in Co Mayo and from that year to 1882 his office was at 36 Dawson Street. In the 1880s he became a JP for Co Roscommon, Registrar of Tithes for Co Mayo, Clerk of the Crown (1878) and Clerk of the Peace for Co Mayo. He opened an office in Castlebar, Co Mayo, to cover these duties, and in Dublin he moved his office in 1883 to No 46 Kildare Street and this remained his office until he died. The firm continues as Whitney More (2019). He was a successful solicitor and for his public duties he was honoured with a knighthood, becoming a Knight Bachelor on 2nd August 1897. According to the 1878 edition of ‘The Landowners of Ireland’ Benjamin owned 272 acres in Co Armagh with a valuation of £79, and 563 acres in Co Roscommon with a valuation of £388. No doubt all this land was leased. He was the sole executor of the will of Isaac North-Bomford, his father-in-law, and a trustee of the marriage settlement of his two North-Bomford sisters-in-law, Mary Jane Emerson and Belinda Emily L’Estrange. St Mary COI parish records, Dublin, record their marriage on 12 April 1860: Benjamin Whitney, solicitor of 8 Mid Gardiner St and 63 Lower Gardiner St, son of Nicholas Whitney, solicitor, and Annabella Bomford [not North-Bomford] of 17 Lower Dominick St, daughter of Isaac North Bomford [not hyphenated] Esq, of 17 Lr Dominick St.
2. Mabel Rosamond Whitney, b 1883, d 24 Jul 1944. The 1911 census for 29 Fitzwilliam Street, Dublin, records Benjamin Whitney, widower, aged 77, Knight solicitor in practice, b New Ross, Co Waterford, as head of household; with daughter Belinda Whitney, unmarried, aged 36 (so b 1875), b 29 Upper Fitzwilliam St, Dublin, no occupation; and daughter Mabel Rosamond Whitney, unmarried, aged 28 (so b 1883), b Bray, Co Wicklow, no occupation. Plus a French maid 'to my daughter', b Aix-les-Bains, Savoie, aged 29; a visitor, Louise Wolfe, aged 58, married 18 years, no occupation, b Roulour, Normandy; a coachman and his 19 year old son, a clerk in the National Bank; a butler; a cook; a house maid; and a kitchen maid. Annabella was of full age (i.e. 21 or older) when she married in 1860. So she would have been at least 36 when Belinda was born in 1875, and at least 44 when Mabel Rosamond was born in 1883. An unusual pattern, but by no means impossible. On 22 April 1914, at Dublin South, Mabel Rosamond Whitney of 29 Upper Fitzwilliam Street, married Harry Brereton Molony, detective inspector in the Royal Irish Constabulary, of Bray, Co Wicklow. He was the son of a medical doctor. Harry died on 3 Aug 1938 in Surrey, UK: probate was granted to his wife, Rosamond Molony. Belinda Whitney, spinster, died at 29 Upper Fitzwilliam St on 24 March 1917 with effects valued at £46,424 (probate). Mabel was her executor. Mabel Rosamond Molony, widow, died at St Helens, Hastings, Sussex on 24 July 1944 (notice in the London Gazette, page 5662, 8 Dec 1944). Claims to be sent to Whitney, Moore and Keller, solicitors, Dublin. On 16th January 1899 Annabella, Lady Whitney, died aged about 63, and Sir Benjamin lived on until 1916: he died on 21st December 1916 (probate), aged 83, with effects valued at £27,540. Belinda was his executor. John was the second son who eventually inherited Ferrans and Gallow. A number of deeds which concern him and his life will be found in Chapter 28. David was the 3rd son, and probably the 5th child, and was born on 5th February 1840. In April 1860 he became a trustee of his sister’s marriage settlement when she married Benjamin Whitney, and his address is given as 17 Dominick Street, Dublin, where he lived with his father (his mother had died in 1852), his two unmarried brothers and his unmarried sister; at this date he was just 20 and studying to become a doctor. Seven years later Thom’s Directory lists him as ‘LRCSI’ (Licentiate of the Royal College of Surgeons in Ireland) and ‘LRCP Edin’ (Licentiate of the Royal College of Physicians of Edinburgh), so he had qualified as a Doctor and Surgeon in or before 1867. He most probably first went to Edinburgh and there qualified as a physician, and perhaps practised there for a short time; later he returned to Dublin and trained there as a surgeon. Thom’s Directories of 1867, 1968 and 1969 give his address as Kilcock which would be the address of Ferrans, but it is doubtful if he ever practised there since the next deed of 1867 records him as “MD of Castleconnell, Co Limerick”. At this date Castleconnell was a spa on the Shannon and full of fine late-Georgian houses, all of which sounds as though it was a rich practise for the ‘carriage-trade’. It was no doubt at Castleconnell that he met his future wife Mary Gubbins, and they were married in 1867, probably in June. Two deeds have been found concerning the marriage settlement to which the Gubbins family contributed £1,500 and David insured his life and gave £1,300 to the trustees for the premium payments. The deed gives no date for the marriage and no marriage licence has been found, but it must have been after the second deed, in June or later in 1867. 1. David George North-Bomford, MD of Castleconnell, Co Limerick. 2. William Gough Gubbins (father) of Woodstown, Co Limerick. 3. Mary Gubbins (Russell) (mother), wife of William Gough Gubbins. 4. John Russell Gubbins (brother) of Lima, Peru, in South America, eldest son of William Gough Gubbins. 5. Mary Gubbins, spinster, daughter of William Gough Gubbins. 6. John Emerson (David’s brother-in-law) of Banagher, King’s Co, and John Russell (probably a cousin of Mary Gubbins) of Glenview, Co Limerick. The only reference to the Gubbins family was found in Walford’s County Families from which most of the following has come. The eldest son of Joseph Gubbins of Maidstone Castle, Co Limerick, was Reverend George Gough Gubbins of Maidstown Castle married Mary, a daughter of John Bennett. Their youngest son was William Gough Gubbins of Castle Troy, Co Limerick, JP, born 1820, married in 1844 Mary, 2nd daughter of John Russell, JP. The Rev George Gubbins had a daughter Alice who married Francis Watkins and lived at Ashfort Vale, in Drumsna, Roscommon and had 2 daughters: Harrietta and Bessie Dorathea. Francis died in 1896 aged 63 (Louise Nettle email 31 Jan 2015). William, (who was alive in 1900), and Mary had a number of children of whom Walfords only records the eldest son, but based on the marriage settlement we can add our Mary as a daughter. The eldest son was John Russell Gubbins, born 1845 and who in 1867 was working in Lima, Peru. James William Gubbins of Lismullane, Co Limerick could be another brother of Mary and John Russell Gubbins; but he could also be of the other branch of the Gubbins family of Kilfrush, near Hospital in County Limerick. According to Walfords this branch consisted of at least three brothers, Joseph, Thomas and John, whose father was Joseph Gubbins of Kilfrush who had died in 1850. John Russell, one of the trustees, would be a relative of Mary Russell who in 1844 married William Gough Gubbins, perhaps a nephew and so another cousin of Mary and David North-Bomford. 1. Elliott Elmes Whitney of Woodlands, Co Wexford, and Benjamin Whitney of Upper Fitzwilliam Street Dublin. 2. Benjamin Whitney, sole executor of the will of Isaac North-Bomford late of Ferrans deceased. This £2,150 could be the repayment of a mortgage but it is thought more likely that it was left to David in his father’s will since Benjamin Whitney as executor directed the payment. David was only 29 when he died on 13th October 1869 (ex Burke). One can assume that he was still a doctor in Castleconnell. His wife Mary and their little daughter, Annabella, their only child aged 1 (27.8.8), went to live at Castle Troy, Co Limerick, with her parents William Gough Gubbins and Mary (Russell). David's death is indexed in Irish Will Calendars, 1858-1878. The Index to Probate and Administration Calendars 1858 - 1877 (National Archives, Dublin) records that David George Bomford MD died intestate on 13 October 1869 at Ingoldsby Lodge, Castleconnell, Co Limerick. Administration was granted on 4 December 1869 to his widow Mary Bomford of Castletroy (Limerick), Co Limerick, effects under £800. Given his age and lack of a will, it can be assumed he died suddenly, perhaps in an accident. Two years after David George died, Mary married secondly Francis Burton Keane of Hermitage, near Ennis in Co Clare (Burke). 1. Francis Burton Keane of Hermitage, Ennis, Co Clare. 4. William Gough Gubbins of Castle Troy, and John Russell. 5. Captain Walter James Pollard, RN of Training Ship ‘Southampton’ now stationed at Hull, Co York, and Thomas Pilkington of Water Park, Co Clare. 6. William Gough Gubbins and Captain Charles Keane of Hermitage, Ennis, Co Clare. 1. A marriage is about to be solemnised between Francis Burton Keane and Mary North-Bomford. 2, Francis Burton Keane has a £1,000 Life Insurance Policy. The Keane family had been living near Ennis since about 1650 and claim ancestry from the ancient Celtic Irish clan of the O’Cahanes. Francis’ parents were Francis Nathaniel Keane (1803 - 1880) of Hermitage, and Hanna Maria (died 1883) daughter of Sir Christopher Marrett of Limerick. Three of Francis’ brothers had died before 1871 which left him with an elder brother, Charles (one of the trustees), a Captain in the 86th or Leinster Regiment, but he died unmarried in 1876 so Francis inherited the property when his father died in 1880. There were four sisters, Hannah Maria, Jane, Sarah and Susanna; in 1863 Jane married Captain Walter James Pollard, Royal Navy, another of the trustees, 1818 - 1879, third son of William Pollard of Castle Pollard, Co Westmeath; the other three sisters did not marry. Francis Burton Keane was born in 1844, educated at Trinity College and became a JP. He and Mary (North-Bomford), together with Mary’s baby, Annabella North-Bomford, appear to have lived at Hermitage after the marriage and indeed they probably ran the place since his parents were elderly. The marriage lasted for 24 years until Mary died on 15th January 1895. Francis lived on for another 12 years and died on 20th August 1908. 1. Francis Thomas Keane, born 24th August 1872. He did not inherit so he may have died young. 2. Charles Owen Keane, born 11th September 1875 and died 4th January 1924. He married and had children. His eldest son inherited and sold Hermitage. 4. Marie Sarita Keane who in 1897 married William James Macnamara of Co Clare. He was born in 1863 and died without children. She died in 1947. He was a trustee of Annabella North-Bomford’s marriage settlement of 1899 (27.8.9). 5 . Olive Maria Keane died unmarried in 1959. 6 . Ethel Frances Keane married and died in Australia in 1967. Francis Burton Keane had twelve uncles and aunts; one of his aunts, Anne, married Thomas Pilkington who was a trustee in the marriage settlement. There does not appear to be any connection between these Pilkingtons of Co Clare and those of Tore in Co Westmeath. It will be remembered that Isaac North-Bomford married Belinda Emily Pilkington of Westmeath (23.2). David George North-Bomford and Mary Gubbins had one daughter, Annabella Bomford, also known as Annie [Colin Keane email 2 April 2007], who was born on 6 April 1868 at Castleconnell (birth registration, EN email 20 Apr 2012: she was registered just as Bomford - no mention of North). Her father died the next year and her mother remarried in 1871 when Annabella was about three; so she was brought up in her step-father’s house, Hermitage near Ennis, with six younger step-brothers and sisters. Annabella did not marry until she was 31, rather old for those days, and one wonders whether her marriage was held back so that she could assist in looking after the children of her mother’s second marriage; for instance when she was twenty the children were aged 16 down to 6. However on 12th April 1899 she married Thomas Griffin, Bachelor of Law, of Baggot Street, Dublin (ex Burke). Thomas is not mentioned in the Trinity Register of 1928, so either he qualified elsewhere or he had died before 1928, and the only reference to him comes from the marriage settlement, which gives no details. 2. John Russell of Glenview, Co Limerick (trustee of her mother’s marriage settlement of 1867), and Horatio North-Bomford of Tyrrell’s Pass House, Co Westmeath, (her uncle and another trustee of her mother’s marriage settlement). 3. William James Macnamara of Bushy Park, Co Clare (near Ennis, younger son of Lieutenant-Colonel Francis Macnamara of Doolan and Ennistymon House, and husband of Annabella’s step-sister Marie Sarita Keane), and Charles Owen Keane of Hermitage, Ennis, (step-brother of Annabella), (the two trustees). 2. A marriage had been arranged between Annabella North-Bomford and Thomas Griffin. (It took place the next day). One of the grandchildren of Mary Gubbins' second son by her second marriage, Colin Keane, advises (email 2 April 2007) that Annabella North-Bomford, half sister of his grandfather Charles Owen Keane, died in the mid 1950s (probably c 1957) in Greystones, where she lived with her half sister Olive Keane. There is a record of her gravestone in Redford Cemetery, Greystones, Co. Wicklow: Annabella Griffin, nee North-Bomford, d 6 March 1962; and her son, Maurice F H Griffin, RAMC, Liscrona, Kilkree, Co Clare, d 28 April 1936 aged 31 years. She left a daughter Dorothy Griffin, who married Hal Tweedy and lived for many years near Oughterard, Co Galway. Dorothy died in a Dublin nursing home in the early 1990s leaving a daughter in England called, Colin thinks, Molly Porter. There are however a number of deeds which mention Horatio but they give no clue to his occupation or the names of his two daughters; on the other hand one deed leads to fuller information about his wife. Isaac North-Bomford of Ferrans (Horatio’s father) leases to Horatio North-Bomford of Ferrans that part of Ferrans called Brayfield containing 48 plantation acres (78 statute) for the lives of Horatio North-Bomford and his brother John or for 31 years at a rent of £117.15.0 or £2.10.0 per Irish Acre. (1865 Book 35 No 157). Horatio was only 18 when his father Isaac leased this part of Ferrans to him. It is suggested that he has just left school and his father was trying to get him interested in farming. Isaac died the next year and the year after that, in 1867, Horatio was ‘of Landsdown Road’ in Dublin, so it looks as though the idea of farming failed. In 1886 his brother John bought back the lease. Endorsement on a lease dated 11th July 1867 concerning the building of a lodge to Ferrans House (27.3.1) between John North-Bomford and Horatio. 2. John North-Bomford of Ferrans House, Co Meath. Horatio appears to have had some money that he invested in land mortgages. It is thought that this money must have been his inheritance on his father’s death. There are five mortgages but the information is incomplete concerning some, which were very long and had legal complications which I did not take the time to master. 1. Horatio North-Bomford and Belinda Emily North-Bomford, spinster (Horatio’s younger sister), both of Greenfield, Sutton, Co Dublin. 2. Benjamin Whitney of Upper Fitzwilliam Street, Dublin (husband of Horatio’s sister Annabella, the solicitor). 3. John Shiel of Kilbegnet House, Co Roscommon. 1. The mortgage of 10th December 1868 for £3,750. 2. The above principal sum remains but all the interest has been paid. Now John Shiel has paid the principal sum of £3,750 back to party one and they have returned the land. The mortgage has been discharged. It is not known how much of the £3,750 belonged to Horatio or how much to his sister Belinda Emily. This mortgage is recited in Belinda Emily North-Bomford’s marriage settlement of April 1878 (27.10.1). In it Hugh Lyons Montgomery was given two sums, £600 and £1,400. The deed states that the £1,400 was owed to Belinda in December 1877 but had been paid back by April 1878. There is no specific mention of the repayment of the £600, which one assumes belonged to Horatio. Since the details of these mortgages are not complete there is not much to be said about them except that Horatio must have had about £2,500 to invest around 1870, a very satisfactory amount for those days. However one cannot help but speculate whether the first two mortgages were ended in 1875 by chance or design. Was 1875 an important year for Horatio? I suspect that Horatio was married in 1875 and required the money for his marriage settlement. Burke gives no date for the marriage and simply states that Horatio married “Alice, daughter of Richard Summers of Tyrrellspass, Co Westmeath.” A complete blank was drawn concerning the Summers family until the following deed was found which put the investigation onto a different tack. Maria Jane Somers leased to George Ridgeway Goodbody a plot of ground (the dimensions are given) on the south side of Duke Street leading from Grafton Street to Dawson Street. Now the rents are to be paid to Party 1. The rents are not important though it is interesting that Horatio’s wife receives a share. What is important is the spelling of “Summers”. The new spelling, “Somers”, showed as an entry in Walford’s County Families of 1900. The subject in Walfords is John Richard Somers, JP, of Tyrrellspass, Killucan, Co Westmeath, and of Friarsland, Dundrum, Co Dublin. He was the eldest son of Richard Somers of Tyrrellspass, by Anne Sarah Fouance, daughter of Thomas Fouance also of Tyrrellspass (Thomas Fouace [sic] of Tyrrellspass, Westmeath, left a will signed 27 July 1791, leaving legacies to his d ear wife Sarah, son Charles Fouace, and daughters Ann Sarah & Margaret, both unmarried in July 1791. He had holdings in Tyrrellspass & Killavalley, a house at corner of Duke St & Grafton St, Dublin, and an interest in houses in Dame St and Mary St, Dublin: National Archive T13229, Eva North email 24 May 2009) . John Richard was born in 1814 and succeeded in 1848 when one assumes his father Richard Somers died. In 1836 John Richard married Maria Jane Handy of the above deed when she was a widow, 6th daughter of Samuel Handy of Bracca Castle, Co Westmeath, and “has with other issue”, Richard John, late Captain 11th Hussars; born 1838, married 1870 Jane, a daughter of the Rev Peter Marsh. From all this it is clear that Horatio married Alice Louisa Emily Somers, a daughter of John Richard Somers (born 1814 and died before 1895; an extract of his will in the National Archives records his death on 5 October 1894 at 41 Wellington Road; his executors were Marcus Anthony Levings of Newpark, Athlone, Co Roscommon, and Colonel James Henry Dopping of Bellavista, Blackrock (Eva North email 3 Apr 2008)) of Tyrrellspass House in Westmeath, and of Friarsland, Co Dublin, and Maria Jane Handy, 6th daughter of Samuel Handy of Bracca Castle, Co Westmeath. Alice had at least one brother, Captain Richard John Somers, and a sister, Jeanette Gertrude Somers, b 5 September 1844, who married Joseph Pim North (23.7.3). There is a will for Richard Somers in the National Archive: he died on 16 Jan 1890 and probate was granted in the sum of £787 to Anne Somers, spinster, his daughter (Eva North email 3 Apr 2008). There was no record of the date when Horatio married Alice, but in the 1911 census they are recorded as having been married for 34 years, i.e. in c1877. They had a son, Isaac John (see below), and two daughters (Burke). Not even the names of the daughters were recorded in Burke, but the son was born in 1882. The 1911 census records Horatio as an ex Captain of the Cornwell Rangers, aged 64, living at a hotel in Tyrrellspass (presumably Tyrrellspass House) with his wife Alice aged 53 (ie born c1858) and born in Westmeath, and daughter Norah, aged 26, scholar, born in Dublin city. So Norah would have been born c1885. The census records that the couple had been married 34 years (ie married c1877) and had three children, all living (CN email 25 Nov 2010). There is a burial record for an Alice Bomford North of Tyrrellspass House indicating that Alice was buried on 12 April 1924 (Parish of Newtownfartullagh records, COI library, Churchtown: EN email 29 Mar 2009). She may have been either the daughter or the mother. Sandford COI parish records, Dublin, record the baptism of Ethel Alice Joy North-Bomford, b 1878, baptised 1878, daughter of Horatio North-Bomford, gentleman, and Alice L E, of 98 Bushfield Ave: that record would seem to coincide with 'Ivy' North-Bomford recorded as aged 23 in the 1901 census - a closer look at the original suggests 'Ivy' is probably 'Joy'. Norah North-Bomford is buried in the Mount Jerome Cemetery, d 8 October 1959. From the census records she was born about 1891, so she would have been about 68 when she died. It is difficult to state where Horatio lived, he seems to have had no permanent home but lived mostly in Dublin. Using the deeds and Almanacks it would seem that Horatio lived at Ferrans until he was about 20. Then before his marriage, he moved to Dublin. valued at £47. He sold this house to Robert Maxwell Crawford who owned Oakley Park before George Bomford bought it. St Stephen’s Green was also given as his address in 1867 and 1871, and it is suggested that his work, whatever that was, was there. but in 1882 there is mention of Lara in Co Meath (28.4.1). which his older brother John probably owned. This house belonged to Alice’s brother, Captain Richard John Somers, whose date of death is not known but he was alive in 1900. Deeds of 1900, 1903, 1904 and 1905, and the 1911 census, place both Alice and Horatio at this house. To date the Dublin Directories after 1900 have not been studied, and these may give further details of Horatio’s residences and even his work and death. No definite dates have been found, although a reference to Horatio’s will, dated 1935, has been spotted; unfortunately the source is missing so this date may be erroneous. However 1935 is a possible date since Horatio would have been 88 that year; he was alive in 1926 certainly. Similarly all that can be said about Alice is that she was alive in 1906; she would have been in her 50s or 60s then so she may have lived on for a few years. From the 1911 census we know Alice was alive in 1911 aged 53, so born c1858, in Westmeath. She may be the Alice North Bomford who was buried at Tyrrellspass on 12 April 1924 (Parish of Newtownfartullagh records, COI library, Churchtown: EN email 29 Mar 2009); or that may be her daughter. The National Archives have probate record of the will of Alice Louisa Emily North Bomford, married woman, late of Tyrrell's Pass, died on 12 Apr 1924, executor Isaac J North, effects £1815 12s 9d (see the 'attached image' at http://adlib.nationalarchives.ie/detail.aspx?parentpriref=110765158#: page 14 of the 1924 Probate Calendar). They had two daughters and a son. The son, Isaac John, became a clergyman and much of his story comes from Canon Leslie’s Succession Lists. He was born on 14th April 1882, probably in Dublin, and was educated at Trinity College in Dublin. He graduated in 1905 with a BA in modern literature, and MA in 1911. According to Guy Bomford (26.7.4) his interests were in French and English literature. Isaac was ordained in 1907 and became curate at St Nicholas, Galway, from 1907 to 1916. St Nicholas is the second largest ancient Parish Church in Ireland and tradition has it that Christopher Columbus heard mass in this venerable church before the dangers of his voyage. In the 1911 census he was 28 and living in a lodging house in Kilcorkey, Galway South Urban. From 1916 to 1924 he was Rector of Headford, about 15 miles north of Galway Town. In 1925 he became Rector of St Mary's Parish Church at Athenry, 14 miles east of Galway, and was Prebendary of Laccagh. From 1950 to 1960 he was “Provost of Tuam”, this might mean that he was provost of the Diocesan College of St Jarlath, a seminary for the clergy beside Tuam Cathedral. In 1960 he retired as a Canon, and on 2nd September 1968 he died unmarried, aged 86. He was buried in the Athenry New Cemetery. Photo of gravestone, which reads 'In remembrance of Canon I. J. North Bomford of the Rectory Athenry, died 2nd Sept 1968, aged 85 years' (Conall O'Cuinn email 11 Mar 2019). The National Library of Ireland holds an 'Ulster Bank Athenry branch account book for Canon I J North Bomford for 1951, copies of whose Testimonials are also included' (http://catalogue.nli.ie/Record/vtls000539966). Belinda was probably the youngest of Isaac’s family of nine, and was born about 1849. She was named after her mother, Belinda Emily. In 1852, when she was about 3, her mother died leaving her to be brought up by her father, aged 54, aided no doubt by her sister Annabella then about 16. In 1866 when she was 17 her father died. Twelve years later in 1878, she married Lieutenant-Colonel Edward Napoleon L’Estrange as his second wife. This is the second Bomford – L’Estrange marriage; the first one was between Belinda’s great-grand-aunt Anne Bomford and Colonel Edward’s great-great-grand-uncle Samuel L’Estrange in 1750 (8.5). The early L’Estrange family is recorded in paragraph 8.5.2 and the following gives additional information on the later L’Estrange family. The great-grandparents of Lieutenant-Colonel Edward Napoleon L’Estrange were Anne, the only daughter of John L’Estrange of Churchtown and Downdaniel, Co Westmeath, who married her cousin Edmund L’Estrange of Clonsheever in Westmeath, the only son of Edmund and Alicia (Ussher). Some sources record these two ‘Edmunds’ as ‘Edward’. Edward L’Estrange served with the 14th and 70th Regiments in the Peninsular War and in India, and became a Major-General (see 18.5.5). He died unmarried. Lieutenant-Colonel Albert Halahan L’Estrange, RAMC, 1844 – 1924. He married Martha Elizabeth, daughter of Henry Alexander Taylor. Martha died about 1917 and their grandchildren are alive. Francis Adolphus, born 1842, Col RAMC, married 1879, Annie daughter of the Honourable William MacDonald of Jamaica. Catherine Eliza Matthews, another daughter of the Rev John Matthews (above). She died on 24th August 1865 and he on 6th January 1875, so by the time Belinda Emily married their son, both were dead, as were the uncles and aunt. They had seven children. George Wellington L’Estrange born 1841 became the Colonel commanding the 8th Battalion of the Rifle Brigade. He died unmarried. Catherine L’Estrange married Captain W. Sheffield Hardinge of the Cheshire Regiment, the same regiment as her brother Edward, Belinda’s husband. Olivia Massereene L’Estrange married W.W. Babington of Cork. There were three more unlisted daughters [i.e. sisters or aunts?]. Lieutenant-Colonel Edward Napoleon L’Estrange commanded the Cheshire Regiment and also served with the Royal Scots Fusiliers (21st Regiment). He was gazetted a Captain in 1860 and a Major in 1866 in the Cheshire Regiment; his marriage settlement with Belinda records that in 1878 he was a major in the 21st Regiment of Foot, the Royal Scots Fusiliers, so sometime after his marriage with Belinda he must have returned to the Cheshire Regiment to become its colonel; however the Army List of 1884 shows that he was not with either the Royal Scots Fusiliers or the Cheshire Regiment, so, one assumes, that he must have resigned his commission before 1884, although he might have been on the staff. 3. George L’Estrange who died young in America. 4. Ernest William L’Estrange of the 3rd Connaught Rangers who later went to South Africa and joined the Natal Police. He was born in Madras, India, 11 March 1873. 5. Adelaide L’Estrange who on 11th October 1890 married Captain (Royal Artillery, Royal Irish Division) John Thomas Cramer of Ballindinisk, near Kinsale Co Cork. They had children. a. Gerald George de Courcy-Wheeler, born 6th October 1910 and educated at the Imperial Service College. He served in the RAF in World War II and died unmarried 11th April 1974. After Margaret died on 22nd February 1923, Samuel de Courcy-Wheeler married secondly on 24th March 1924 Dorothy Tuthill, widow of Captain George Duggan and daughter of Henry Johnson of Assam, India. Samuel died on 6th January 1954; Dorothy was alive in 1993. 1. Belinda Emily North-Bomford of 29 Upper Fitzwilliam Street, Dublin, spinster. 2. Edward Napoleon L’Estrange of Landour, Raglan Road, Dublin, a major in the 21st Regt of. Foot (Royal Scots Fusiliers). 3. Benjamin Whitney of 29 Upper FitzWillam Street, (brother-in-law to Belinda with whom she was staying) and George Wellington L’Estrange of Landour, Raglan Road, (brother of Edward who was staying with him). 1. A mortgage of 6th June 1877 to secure two sums, £600 and £1400, made between Hugh Lyons Montgomery (MP, 1816 - 1882, of Co Leitrim) by Horatio North-Bomford and Belinda Emily North-Bomford, and as at 6th December 1877 the sum of £1,400 is owing to Belinda Emily. 2. A marriage is intended between Belinda Emily North-Bomford and Edward Napoleon L’Estrange. So Belinda Emily gives the £1,400 to Party 3, the trustees, as her marriage portion, and Edward Napoleon L’Estrange gives land in Co Leitrim to Party 3 as his marriage portion. It is not known when the wedding took place and no other record has been seen; no doubt it occurred later on in April 1878 when Edward was about 46 and Belinda about 29. St Stephen COI parish records confirm that: on 2 April 1878 Edward Napoleon L'Estrange, Major in the Royal Scots Fusiliers, of Landore Raglan Road, married Belinda Emily Bomford of full age, of 29 Upper Fitzwilliam St, daughter of Isaac North Bomford, MD. H Bomford was witness for the wife. Nothing has been found to indicate their movements after the wedding, except that for three or four years Edward was still in the army. The only firm date is the death of Lieutenant-Colonel Edward on 26th June 1890, aged about 58. It is thought that Belinda Emily lived on, as she was much younger. They had one son (27.10.2). Edward was born in March 1883. On the 6 January 1900 when he was 17 he was gazetted 2nd Lieut in the 8th (Carlow Rifles Militia) Battalion King’s Royal Rifle Corps and stationed at Templemore, Co Tipperary. On 28th June 1900 he and about 1000 men of the 8th KRR Militia embarked on the ‘Canada’ and left Queenstown for South Africa. On 17th July 1900 they arrived at Capetown and proceeded to Pietermaritzburg to join the 1st KRR Corps in the field. Edward was promoted on 18th July 1900 to Lieutenant in the Militia. On 5th August 1900 Lieut L’Estrange joined the 1st KRRC at Zand Spruit for active service against the Boer. During August, September and October Lieut L’Estrange’s battalion was in active contact with the Boers. At the beginning of November his Militia Battalion was released from active service and Edward and his men embarked on the ‘Yorkshire’ to return to England. They left on the 15th November and arrived at Plymouth on 8th December and Edward returned to his home in Ireland. On 5th January 1901 Edward was posted to the 2nd Leinster Regiment in Barbados, West Indies. After nearly a year he and most of the 2nd Leinster Regiment embarked on the 26th December 1901 and left Barbados in the ‘Sicilia’ for service in South Africa. They arrived at Capetown on 16th January 1902. During January, February and March he moved from Johannesburg to Harrismith, Frankfurt, Tafel Kop, Heilbron to Pretoria. They remain at Pretoria until peace was decleared and the men slowly returned home. However Edward applied for service with the Indian Army. On 8th June 1904 he disembarked in India and joined the 2nd Royal Scots at Allahabad. Finally on the 5th August 1905 Edward was appointed to the Indian Army and joined the 79th Carnatic Infantry at Cannanore, later to become the 3/3rd Madras Regiment. Edward was promoted to Captain on 31st December 1909. 6 weeks later on the 12th February 1910 Captain Edward Bomford L’Estrange, aged 27, married in Bombay, Hilaire Frances Elizabeth de Courcy-Wheeler, the youngest daughter of Doctor William Ireland de Courcy-Wheeler, 1844-1899, MD of Robertstown, County Kildare, and sister of Lieutenant-Colonel Samuel Gerald de Courcy-Wheeler who married Edward’s youngest step-sister, Margaret in 1908. In September 1910 Edward was appointed Adjutant Nagpur Volunteer Rifles and remained until 30th June 1915 when he was relieved of his appointment with the Nagpur Rifles. In early July he became Staff Captain with the Jubbulpore Brigade. In September 1915 he was appointed Major and attached to the 74th Punjabis. In February 1916 he was on active service in Iraq and January 1918 he was with the Egyptian Expeditionary Force becoming 2nd I/C of the 79th Infantry in August 1918. From November 1919 until August 1920 he saw active service in Iraq, and from October until December 1920 he saw active service in North-West Persia (Iran). From Persia and Iraq he returned to India, reaching Trichinopoly on 10th July 1921. On 1st September 1925 he was promoted to Lieut-Colonel and appointed OC of the 2/3rd Madras Regiment at Madras. He became Commandant of 11/15th Punjab Regiment at Ambala on 1st November 1928. At the reorganisation of the Indian Army after the Great War, Lt Col Edward Bomford L’Estrange was found redundant and retired from the Indian Army in June 1929. Colonel Edward died on 26th June 1951, aged 68, and his wife Hilaire Frances, who was born on the 5th December 1886, died on 7th October 1958, aged 72. They had no children. Isaac North-Bomford (27.1), JP, was born c1792 and married 8th October 1830 Belinda Emily Pilkington, c1804 – 1852. He inherited Ferrans and Gallow from his uncle Isaac Bomford, took the name North-Bomford in 1837, and died 10th October 1866, having had nine children (27.2.1). North family tree. b. Henry Robert Emerson of Dublin, solicitor and land agent. Born c1854. c. Charles H G Emerson, born c1855, of 21 Harbour Road Dalkey and died at Cham, Victoria, Australia, 1934 aged 79.
d. Belinda Emerson, born 25th December 1862, married 15th June 1887 as his second wife, James Cooper-Cooper, born 16th March 1825, of Cooper Hill, Co Limerick. They had no children, but James had 15 children by his first wife. e. Probably, Doctor John J Emerson of Dublin. i. Patricia Bomford Emerson who in 1930 married Edward John Shelford (33.7.1). i. Donald Bomford Emerson, BA 1907 (TCD). Was working in India in 1928. 2. Isaac North-Bomford, born 6th June 1834, Captain 59th Regiment who served in China. Died unmarried 6th April 1862, aged 28.
a. Belinda Whitney, born c1862. b. Mabel Rosamund Whitney, born c1865. 4. John North-Bomford (1838 – 1905) inherited Ferrans and Gallow, married twice and had a son (details in Chapter 28, summary at 28.8). a. Annabella North-Bomford born 1868 and married 12th April 1899 Thomas Griffin lawyer of Dublin. Mary married secondly 14th November 1871 Francis Burton Keane of Hermitage, Co Clare, and had six more children. Mary died 15th January 1895 and Francis Keane died 20th August 1908. 6. Stephen Robert North-Bomford, born c1843 and died in 1856 aged about 13. 7. Louisa Emily North-Bomford, born c1845, and died young. a. Canon Isaac John North-Bomford, born 14th April 1882, MA 1911 TCD, and was ordained in 1907. Curate of St Nicholas, Galway, 1907 - 1916; Rector of Headfort, Co Galway, 1916 – 1924; Rector of Athenry, Co Galway, from 1925; Provost of Tuam 1950-60. He died unmarried 2nd September 1968, aged 86.
b. [possibly: 27.9.4] Ethel A.J. North-Bomford. a. Edward Bomford L’Estrange, born 1883, Lieutenant Colonel in the Indian Army. On 12th February 1910 in Bombay he married Hilaire Frances Elizabeth de Courcy-Wheeler, born 5th December 1886. He died 26th June 1951 aged about 68, and she on 7th October 1958 aged 72, without children.